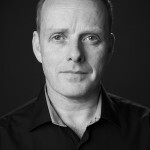 Ciaran is from Sligo and has been a core member of Blue Raincoat Theatre Company since 1991. Working in this ensemble, Ciaran has gained a wealth of “ hands on” experience in all aspects of Theatre life primarily as an actor but, also directing, designing lighting, sets and costumes, set construction, tour management and the many other factors that go into producing a piece of theatre. Ciaran delivers a module “Physical Theatre” for the BA in Performing Arts course at Sligo IT. Ciaran has a wealth of professional theatre training including the Ecole de Mime Corporeal Dramatique, London with Corrine Soum and Steve Wasson, at the Saratoga International Theatre Institute, New York with Anne Bogart and at the Roy Hart Theatre of Voice in Malargues, France. He also has an MA in Drama and Performance from UCD.